A burglar, a spy, a fugitive, a delinquent, a hacker, and a piano teacher... and these are the good guys. Robert Redford leads an all-star cast in one of the most satisfying suspense films! Computer expert Martin Bishop (Redford) heads a team of renegade hackers - including a former CIA employee (Sidney Poitier), a gadgets wizard (Dan Aykroyd), a young genius (River Phoenix) and a blind soundman (David Strathairn) - who are routinely hired to test security systems. 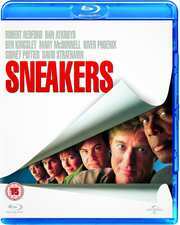 But Bishop`s past comes back to haunt him when government agents blackmail the `sneakers` into carrying out a covert operation; tracking down an elusive black box. Along with his former girlfriend (Mary McDonnell), Bishop`s team retrieves the box and makes a stunning discovery - the device can break into any computer system in the world. With factions from all sides willing to kill for the powerful box, Bishop and his team embark on their most dangerous assignment ever in this exhilarating high-tech caper.